Search the latest Dominion Heights real estate listings in Central Regina below! Dominion Heights is a classic Regina neighbourhood. Charm and simplicity would best explain the homes located in this community. Bungalows are the most popular choice in Dominion Heights with some bi-levels, and split levels among them. There is also a small commercial area located at Park Street and Arcola Avenue. Are you looking for a condominium in Dominion Heights? One of the most unique Regina condominions, located on Lacon Street, is aone of a kind A-frame condos converted from St. Philip's Church in 2004. Dominion Heights also has bungalow style condominion available too. View the most up-to-date Dominion Heights homes for sale available below, or read more about incredible lifestyle that could soon be yours in Central Regina. Towering, mature trees line the streets surrounding the Dominion Heights homes for sale, creating a peaceful, almost sanctuary like feel as you travel through this neighbourhood. Many of the homes in Dominion Heights have detached garages located in the backyard. This style of development creates a privacy screen from your neighbours, and allows homeowners a chance to relax in the backyard. This triangular shaped community is located east of Park street, south of Arcola Avenue, and west of Ring Road. Not only is Dominion Heights conveniently located in central Regina, it also has easy access to the downtown core, the industrial area along Park Street, and is a quick trip to all the east end retail stores and businesses. At the southern tip of Dominion Heights is the Canada Games Athletic Complex located in Douglas Park and Wascana Park. The Canada Games Athletic Complex includes a 400 meter track, long jump and triple jump pits, high jump, pole vault, javelin, hammer and discus areas, spectator seating for 2,100 people, sound system, Leibel Field (artificial turf athletic field), 4 ladies fastball diamonds, 2 athletic fields, baseball diamond, cricket pitch, 5 tennis courts, washrooms with showers. Wascana Park is nearby and the University of Regina can be reached via the pathways either by walking or biking. It is a short commute from Dominion Heights to U of R or Saskatchewan Polytechnic. 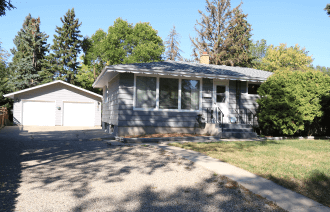 If you'd like more information about the available Dominion Heights homes for sale, take a moment to contact the Tourney Group online or call 306-789-1700 to connect with qualified Regina real estate experts, Tourney Group Real Estate.